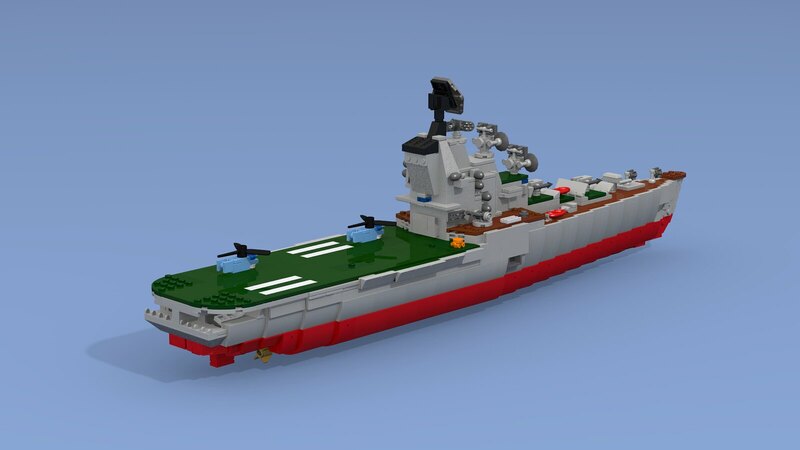 The new version of my favorite ship - ASW-cruiser pr.1123. Now from real LEGO bricks! Sept.2018 - corrected color scheme. The "Condors" were designed primarily as anti-submarine warfare (ASW) vessels, and her weapons and sensor suite was optimized against the nuclear submarine threat. 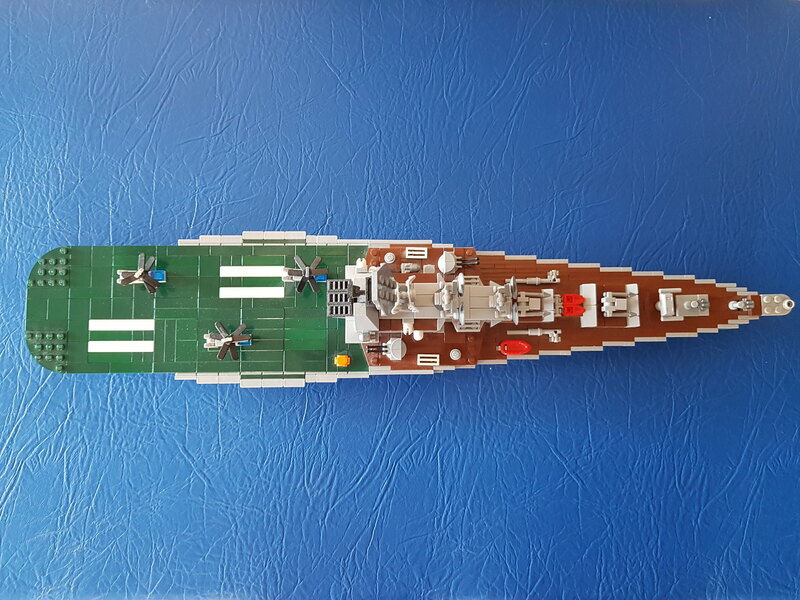 "Condor" combined a cruiser's armament forward with a large helicopter deck aft. Multi-storey superstructure, combined with funnel and tower-like pyramidal fore-mast from lightweight AMG alloys, gave the ship an impressive and spectacular view. I have not built a LEGO model out of real bricks for a long time, so I ran into several difficulties. First, the lack of details. Another problem was the strength of the structure. Solutions that were suitable for virtual modeling proved to be unsuitable in real life)) A lot had to be processed, as a result the model turned out to be very strong and easily disassembled into separate blocks if necessary. The version with the underwater part of the hull. Variants of helicopters on the same scale as the cruiser: Ka-25, Mi-8 and Mi-24. Due to their size, the Mi-8, Mi-14 and Mi-24 helicopters did not fit into the cruiser hangar and were based on the deck. The underwater part of the hull is made easily removable. Joint photo with 1:700 scale build. 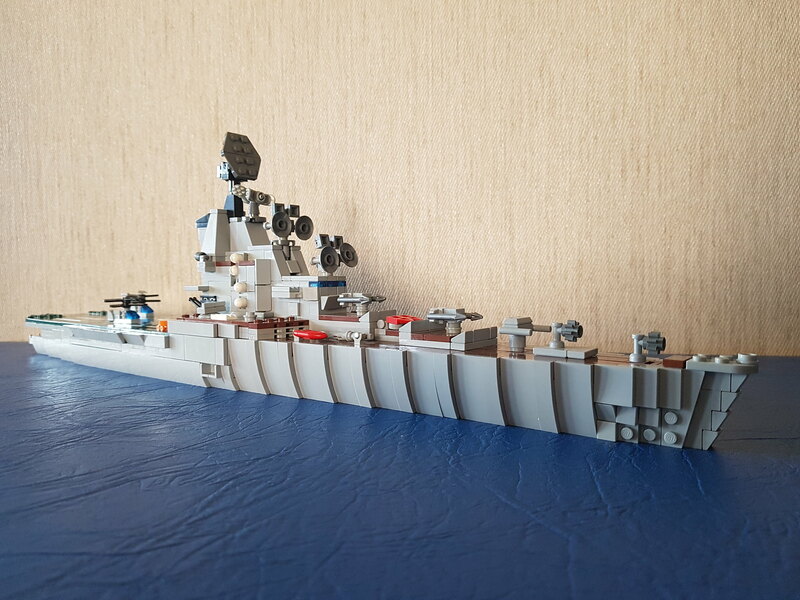 My lightly corrected LDD-model that I used as the basis for the construction of the ship from real bricks. The 3D-rendered LDD-model, corresponding to the construction of the real bricks (with the exception of the invalid in LDD details). 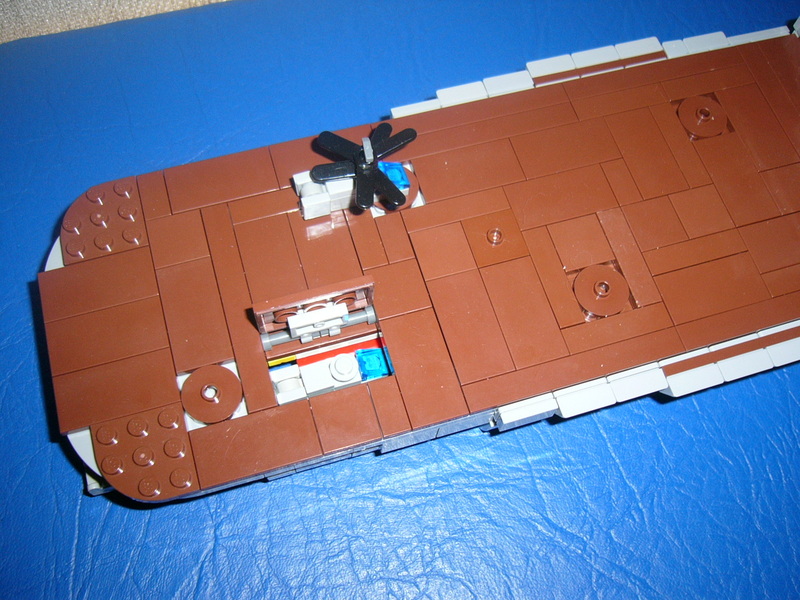 Quoting Hawx 163 Impressive moc, but why do you call it a Condor-class boat? 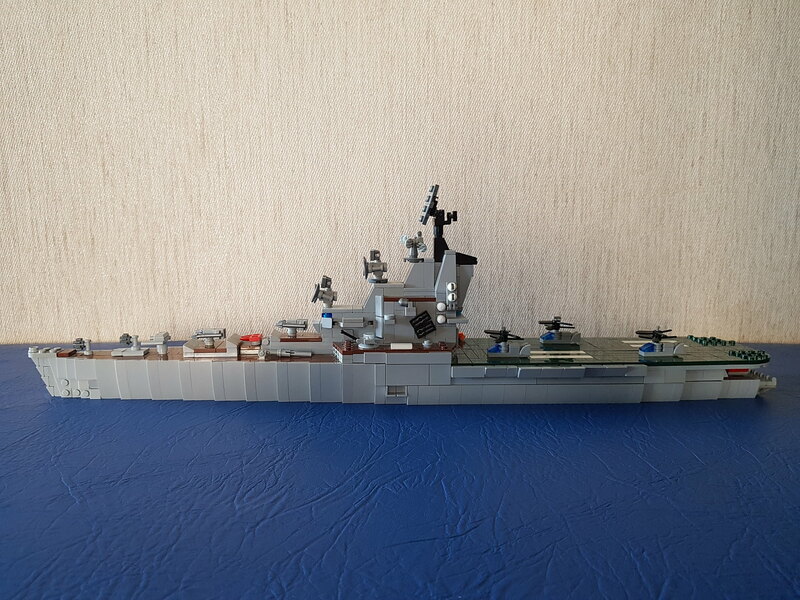 What are the differences with the Moskva class? Thank Yoy, Hawx! Good point! 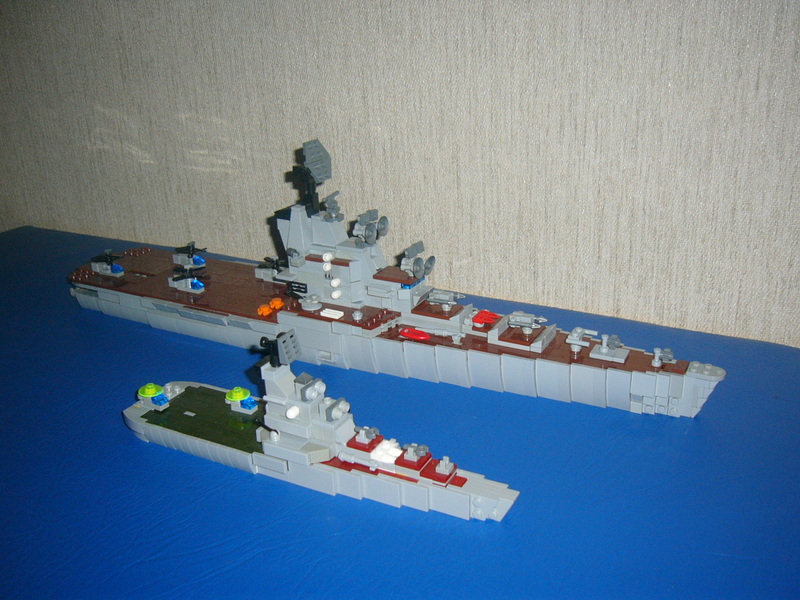 There is no difference :) Moskva is the name of the main ship and the whole series. Condor - the code name of the project of the cruiser. 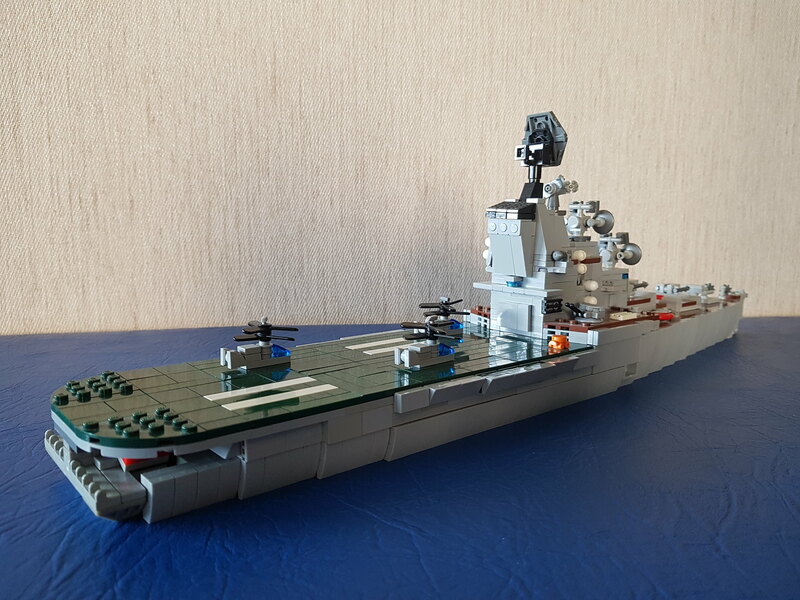 I indicated the name of the Condor in order to avoid confusion, since the name Mokva has already been transferred to another cruiser (ex-Slava), also the flagship of the Black Sea fleet. Impressive moc, but why do you call it a Condor-class boat? What are the differences with the Moskva class? Quoting Ciouran Ray Nice work! I showed your warship to my friends who are members of "United Republic of Legilis" in China and they like it very much! By the way, welcome join our group! Nice work! I showed your warship to my friends who are members of "United Republic of Legilis" in China and they like it very much! By the way, welcome join our group! Quoting Ty Ro Looks very nice so far! Quoting Caleb R. This looks phenomenal! Quoting Mark B. Awesome work once again, especially on the complete hull model. 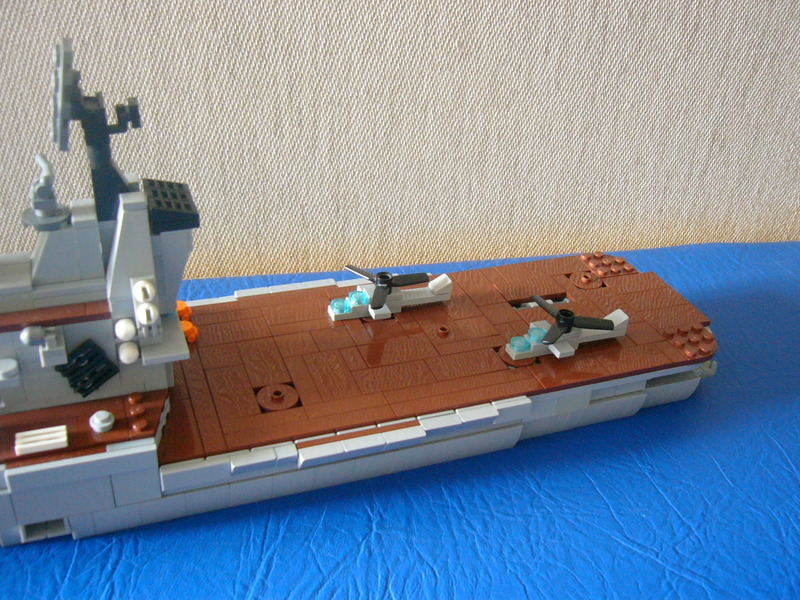 This is one of my favorite ships, so I very carefully worked on the model. There are several elements that need to improve, but I don't have the necessary parts. Thank you for your appreciation, Mark! Awesome work once again, especially on the complete hull model. Yeah, me too! In LDD-editor this is not done. Thank You, Barney! Quoting Petey Bird What a wonderful build! The shape of the hull looks great made out of curved slopes. Really clever to make the underwater part removable. Love the small helicopters too! What a wonderful build! The shape of the hull looks great made out of curved slopes. Really clever to make the underwater part removable. Love the small helicopters too! Quoting James Donovan Well that's a real beauty! Well that's a real beauty! Quoting J Raab Quite impressive. Quoting Daniel Ringuette Great job! Nice shaping on the hull and I really like the mini choppers! Well done! Thank You, Daniel! Your transformers is just wonderful! Great job! Nice shaping on the hull and I really like the mini choppers! Well done! Quoting danilo stanich That is so cool,I've never been much good at building ships,I prefer SPACESHIPS! That is so cool,I've never been much good at building ships,I prefer SPACESHIPS! Quoting Constant Expat Beautiful and clean design, I especially like that the model can be disassembled into different components! Beautiful and clean design, I especially like that the model can be disassembled into different components! Quoting BATOH rossi Great as always! I was hoping to see my Mi 24 embarked ... you have the "production license"! Quoting Kurt's MOCs Beautiful work! 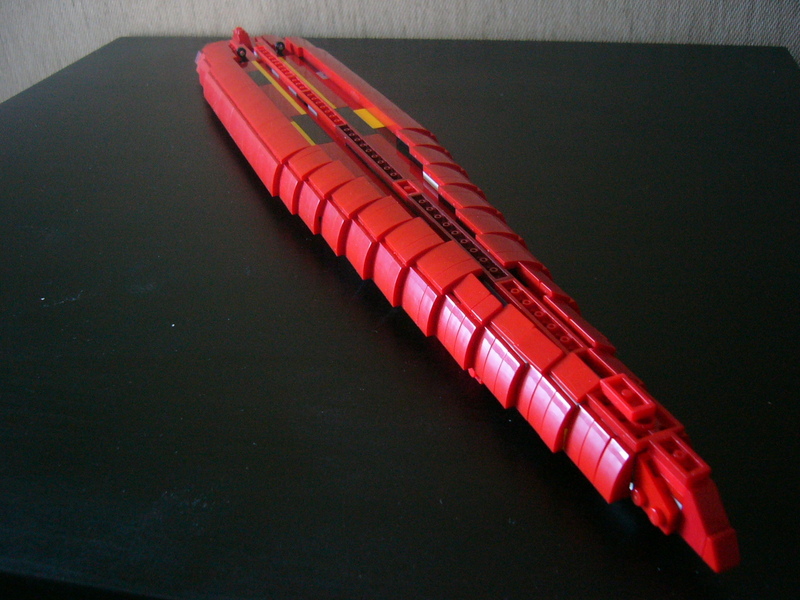 The design of the removable hull is excellent. Great work on the helicopters too! Beautiful work! 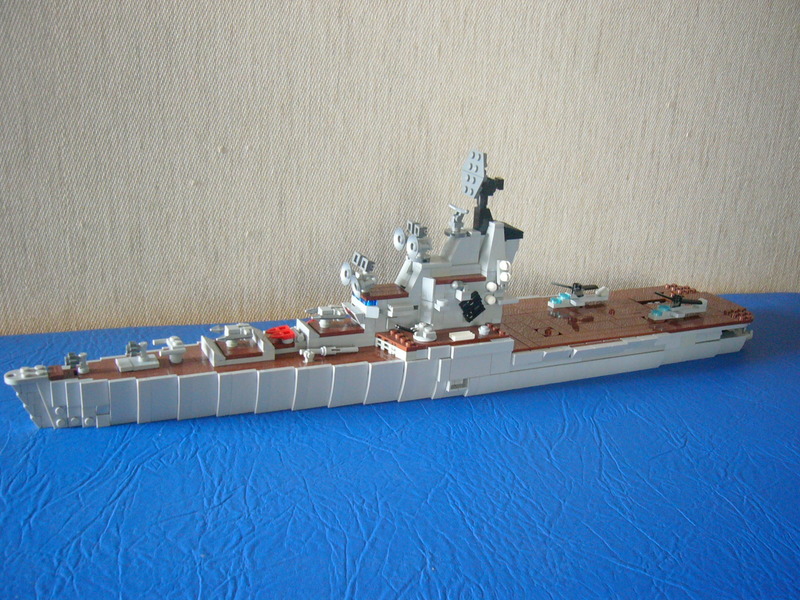 The design of the removable hull is excellent. Great work on the helicopters too! Quoting Fell Skyhawk A beautiful model. Great work. Quoting Oran Cruzen Excellent build sir! Quoting Zentangle . Wow, how did you even... My head hurts just trying to think of the planning and building of this. Not to mention the tedious task of finding each and every piece in the right color. Great Job!! Wow, how did you even... My head hurts just trying to think of the planning and building of this. Not to mention the tedious task of finding each and every piece in the right color. Great Job!! Quoting Nick Barrett This is beautifully designed and even better than the LDD version. Having a separate hull to add to the waterline model is very good. Glad to hear it's sturdy too. This is beautifully designed and even better than the LDD version. Having a separate hull to add to the waterline model is very good. Glad to hear it's sturdy too. Quoting Doug Hughes Yes, in real bricks! Love it!! Yes, in real bricks! Love it!! Quoting C.K. Yee My Friend, indeed you had a highly skill to create this beautiful model. Really awesome and keep it up . Quoting Didier B Nice one ! My Friend, indeed you had a highly skill to create this beautiful model. Really awesome and keep it up . Quoting Johan van der Pluijm Great! Especially considering the small scale. Great! Especially considering the small scale. Quoting Clayton Marchetti It's great to see this in real bricks! I love the Ml-24. I like how you made the model both waterline and the bottom of the hull. The hull looks great nice and smooth. ... Outstanding fob! Quoting Clayton Marchetti If your still looking for screws those 1x1 studs with the 4 peddles in gold look awesome. Quoting Gabor Pauler It is interesting how much better MI-24 looks from real bricks. I think it highly depends on how 1�1 rounded transparent tiles are rendered. Yes, probably. I want to make one more company for these three helicopters - Mi-6. 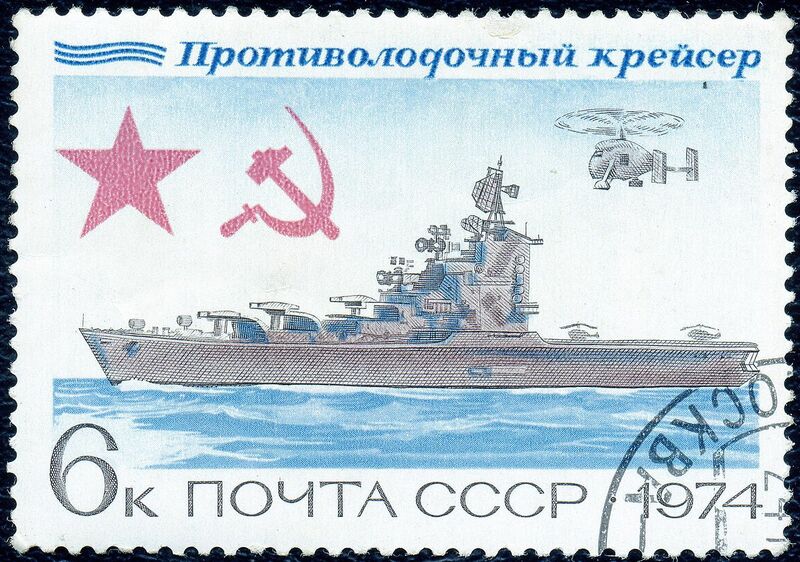 These big machines were sometimes used to deliver cargo to Soviet aircraft carriers. Thank you for comment! Quoting Henrik Jensen Really a pleasure to see a virtual model become real, especially when it`s such a great ship! Also nice to read about your experience in turning an LDD model into something that actually is buildable. A process I always have to consider, since all my models are created as LDD models, before I build them in real bricks. Hope you find the right parts for finishing the hull, Excellent work so far! It's great to see this in real bricks! I love the Ml-24. I like how you made the model both waterline and the bottom of the hull. The hull looks great nice and smooth. If your still looking for screws those 1x1 studs with the 4 peddles in gold look awesome. Outstanding fob! 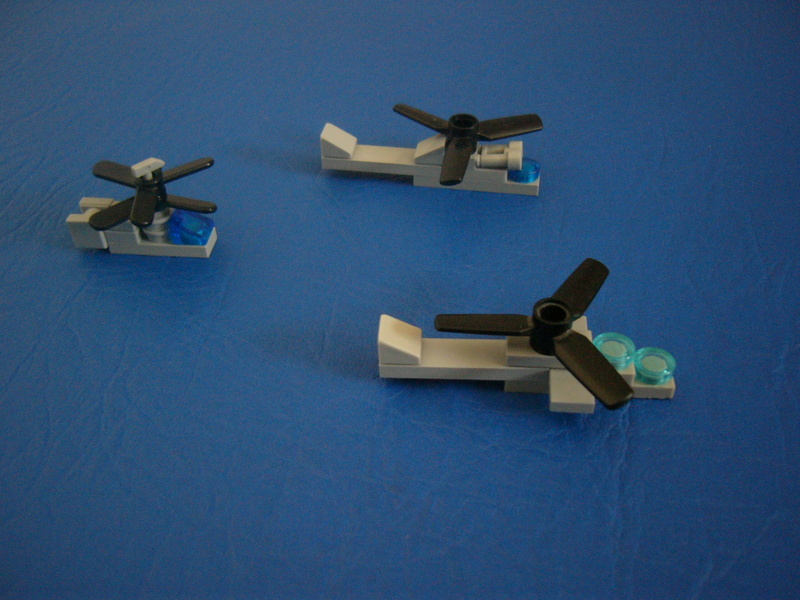 It is interesting how much better MI-24 looks from real bricks. I think it highly depends on how 1�1 rounded transparent tiles are rendered. 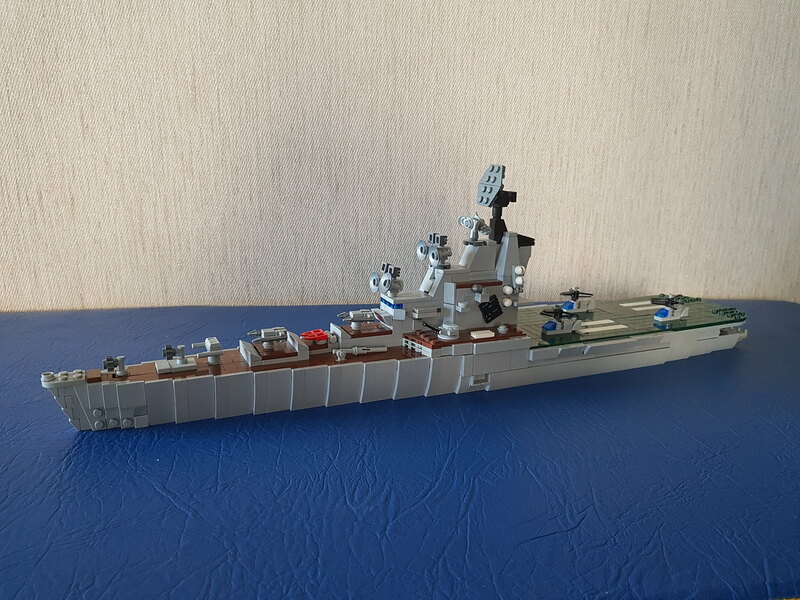 Really a pleasure to see a virtual model become real, especially when it`s such a great ship! Also nice to read about your experience in turning an LDD model into something that actually is buildable. A process I always have to consider, since all my models are created as LDD models, before I build them in real bricks. Hope you find the right parts for finishing the hull, Excellent work so far! Quoting Jeremy McCreary My favorite of your ships, Sraman, and that's saying a lot! Looking forward to seeing the completed underwater hull. Quoting Sven ;o) It's a beautiful model with plenty of detail everywhere. And this in such a small scale. Fantastic! 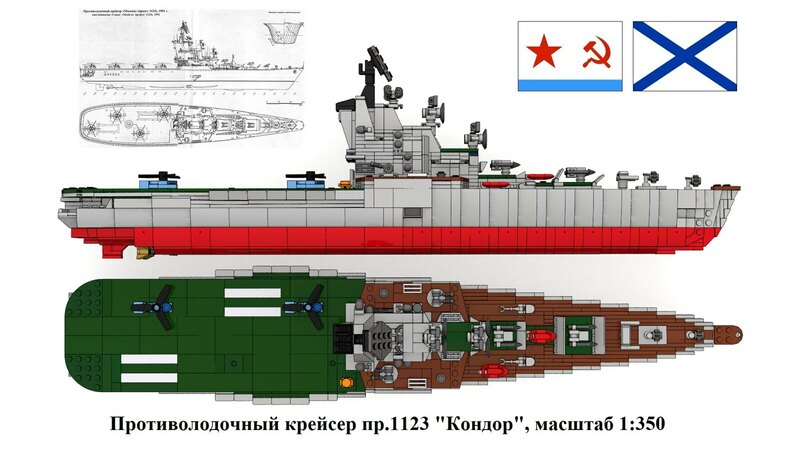 Quoting Jimmie Martinez I see the Grand Admiral of the Micro Soviet Navy is once again launching LEGO seaborne brilliance from the ways. Absolute genius in all phases of construction and detail of this ASW hunter killer. BOAJDTAP, and keep on brickin my very talented friend. My favorite of your ships, Sraman, and that's saying a lot! Looking forward to seeing the completed underwater hull. It's a beautiful model with plenty of detail everywhere. And this in such a small scale. Fantastic! 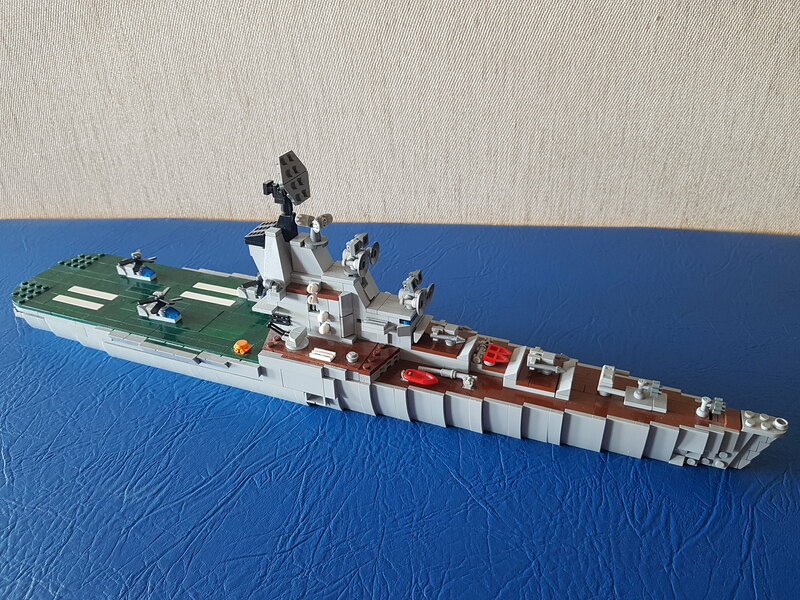 I see the Grand Admiral of the Micro Soviet Navy is once again launching LEGO seaborne brilliance from the ways. Absolute genius in all phases of construction and detail of this ASW hunter killer. BOAJDTAP, and keep on brickin my very talented friend. Quoting Brick Mason I always look forward to your creations' this one doesn't disappoint, well done! Great as always! I was hoping to see my Mi 24 embarked ... you have the "production license"! I always look forward to your creations' this one doesn't disappoint, well done!